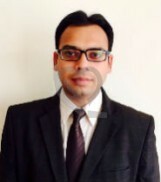 Dr. Amit Garg, MBBS, MS(General Surgery), FMAMBS, is a Consultant in Bariatric & Metabolic Surgery at Fortis Hospital, Mohali. Dr. Grag completed his basic medical studies(MBBS) from Jawaharlal Nehru Medical College, Belgaum, followed by postgraduation(MS) in General Surgery from Bhartividyapeeth Medical College, Pune. During his initial years of residency, he developed a keen interest in Laparoscopy Surgery. Later, after completing his superspeciality fellowship (FMAMBS) in minimally access surgery, he went on to achieve sub specialization in Bariatric & Metabolic Surgery. He got his expert training from the world famed institute in Taiwan, under the guidance of Dr. C K Huang, where he gained the fine art of these advanced surgeries. Dr. Garg’s areas of interest include Laparoscopy, Bariatric & Miminally Invasive Surgeries . To his credits, he has contributed various research papers to peer- reviewed journals. He is an active member of several professional societies and rigorously participates in orations/ CMEs/ workshops to hone his skills & optimize his knowledge according to the latest research / techniques.